Ahh, I'd almost forgotten that February is the month when Valentines Day becomes impossible to get away from! For many people it is traditionally a time to spend courting suitors and receiving tokens from loved ones. However, as there were no new potential suitors on the horizon for me I decided to spend Valentines Eve (which is definitely the correct term for the 13th of February) with my one true love...The theatre! And what better play than Shakespeare in Love to make me forget about my solitariness? The plot, immortalized in the Academy Award winning 1998 film of the same same, follows a young William Shakespeare who is suffering from writer's block while trying to pen an epic comedy entitled 'Romeo and Ethel, the Pirate's Daughter' for Philip Henslowe, the owner of the Rose Theater. He finds his muse in a beautiful merchant's daughter, Viola de Lesseps, who also happens to be Will's biggest fan, and strangely enough, bares a striking resemblance to Thomas Kent, the fresh faced thespian who Will has just cast as his Romeo! Confusion, deceit and comedy ensues (not to mention a bit with a dog!) and soon both cast and audience find themselves embroiled in a forbidden love affair which will warm your heart right up before ripping it out! The script is hilarious at times, with many jokes stemming from the irony of Will as a young, fairly unknown playwright, as opposed to the almost omnipresent being that he has become today. But there are also a number of very touching, tender moments between both lovers and friends. The play is much more than the soppy romcom that it may be perceived as. It's got a lot of heart! Along with a brilliant script, production design is also outstanding! The stage is designed to resemble a Jacobean theater, with lighting, music and minimal props used to suggest a change in location. Interestingly, these techniques are not unlike those used when Shakespeare's plays would have been originally staged, which I'm sure was a conscious choice that really pays off. Indecently, the music (and the incredible vocals which accompanied it at some points) sounded traditional and really helped to set the scene. As for the new cast, Orlando James wows as the handsome but wayward Will. The young man we are introduced to is uninspired, trapped in his own head and leagues away from the iconic balding Bard we're used to seeing in pictures. Meanwhile, the enchanting Eve Ponsonby is instantly likable as Viola de Lesseps, with a voice so listenable and passionate that she could probably stand on stage and read from the phone book for two and a half hours still move everyone to tears. I loved the juxtaposition between the demure, straitlaced Viola who appears in court in order to watch Shakespeare's latest works (and mouth along when she thinks no one is watching), and the Viola who bounces excitedly on her bed and proselytizes frantically to her nurse. The Viola who wears her heart on her sleeve, who is fearless in love! But for me it was Edward Franklin as Shakespeare's frenemy, the gangly swaggering Kit Marlowe, who really stood out in the cast. Despite his rather minimal time on stage, he managed to steal every scene he appeared in, and his comedic timing was excellent. 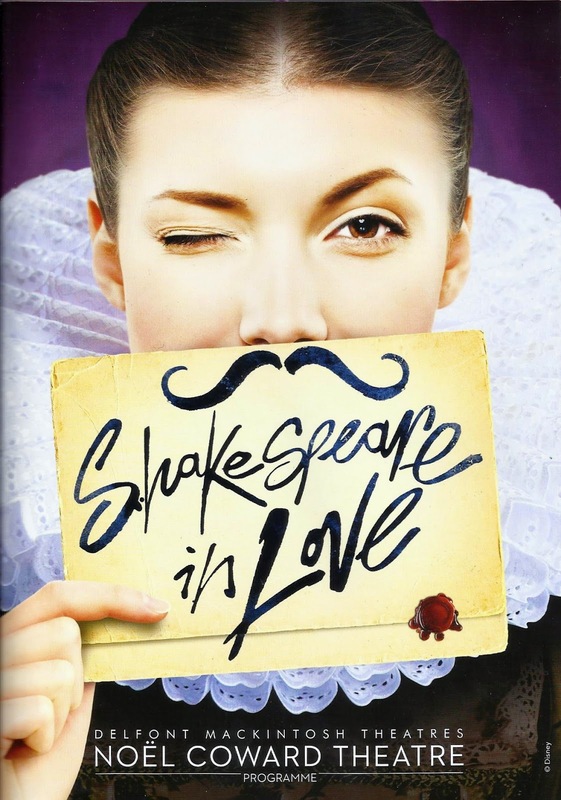 If you're looking for a brilliant play to see this year, then look no further than clever, hilarious and hugely romantic Shakespeare in Love. Guaranteed to be a hit with Bard buffs and those who wouldn't know the difference between Stratford-Upon-Avon and Stratford International!